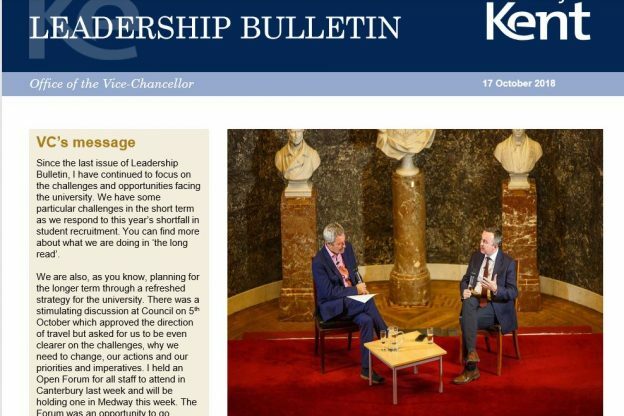 The latest issue of the Leadership Bulletin, designed to give an overview of key developments at Kent, is now available. The latest issue (17 October 2018) includes a summary by our Vice-Chancellor and President Professor Karen Cox on the financial challenges facing the University and plans to overcome them. There are also updates on Executive Group meetings and the launch of this year’s TESSAs (Teaching Enhancement Small Support Awards). The Bulletin is distributed fortnightly to all members of the Leadership Forum to cascade to staff in schools and professional service departments. If you haven’t received your copy yet, you can read the bulletin online. Find out more about the Leadership Bulletin and see previous issues on the OVC webpages. This entry was posted in Campus online on 18 October 2018 by Wendy Raeside.